May Arts carries heart printed ribbon in a wide variety of sizes & styles. Getting ready for Valentine’s day? Try our satin hearts or our heart trimmed ribbon. 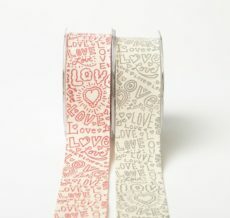 Great for gift wrapping & scrapbooking, or decorate with our wide sheer ribbon.